Does Board Certification Make a Difference? 1) The vital importance of dental health to a person’s entire health and well-being. 2) Constant learning/training is vital to performing at one’s peak. What is involved in becoming Board Certified? Well, let’s put it this way: if the process to become Board Certified was quick and easy, more dentists would be Board Certified! 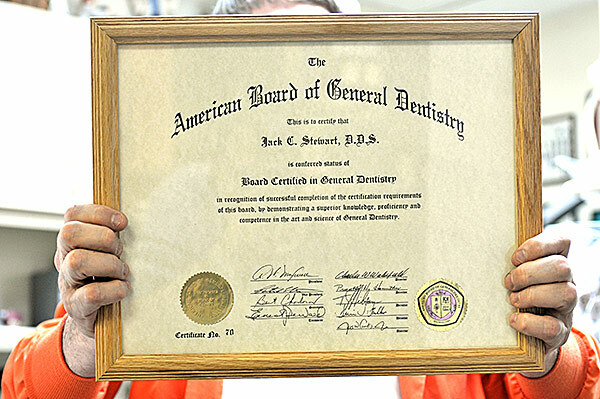 To learn more about what it means to be a Board Certified Dentist, you can visit the web site of the American Board of General Dentistry. But wait, there’s more! Out of those 6 Kansas General Dentists who are Board Certified, there are only 2 who have also attained Mastership Status, Academy of General Dentists (July 2016). And yes, Dr. Jack is 1 of those 2. Read more about what it takes to attain Mastership Status (MAGD). The photo at right could have been a photo of Dr. Jack’s MAGD accreditation. It’s not. Why is that? It is because you get to a point where what matters as much as training is the “philosophy” of care that a Dentist employs. 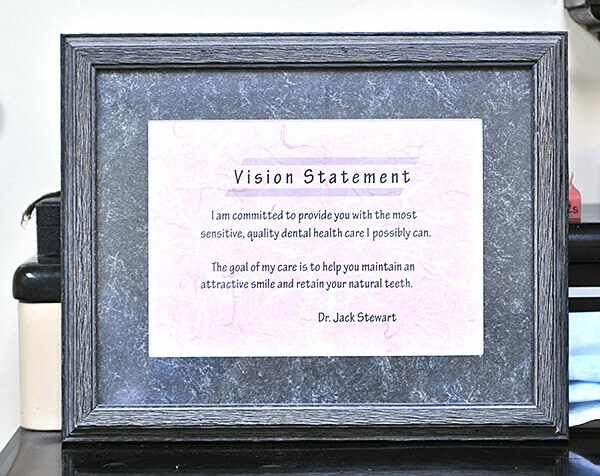 Dr. Jack Stewart’s vision is based in the Golden Rule: he treats his patients the way he would want to be treated, or the way he would want his children treated. He will not perform a procedure on a patient that he would not undergo himself. Most dentists raise prices across the board 6% per year. Not Dr. Jack. He strives to keep his rates low and reasonable and understands it can be hard to make ends meet. Even if you have insurance he is well aware that co-pays always seem to be increasing. Many dental clinics charge "cash pay" customers a higher price than they charge insurance companies. Not Dr. Jack. He offers his "cash pay" customers the same rate that insurance companies pay. Dr. Jack will not perform a procedure on a patient that he would not perform on one of his children. Contact Dr. Jack Stewart for an Appointment! Want to set up an appointment? Or have a question for Dr. Jack? Click the button at right to contact him.